The £1/ €1.95 Highlight – You can’t afford to not pick this beauty up! Your eyes are not deceiving you, you did read that right! 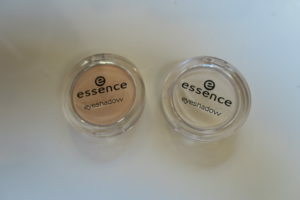 The bargainous highlight in question is actually an eyeshadow and comes from budget German brand Essence! So a bit about the brand…Essence was started by a fearless, entrepreneurial woman called Christina in 2001. Christina and her team wanted to create a brand that was fun and offered great quality products at excellent prices. Their hard work payed off and in 2007, Essence became Germany’s #1 as well as being stocked in 50 other countries! The brand has gone from strength to strength and is now stocked and enjoying success globally, with them them taking the US and Canadian markets by storm too! Being a budget brand doesn’t stop Essence from being socially conscious…they believe in giving back, supporting several charitable organisations and Essence is also a completely cruelty free brand. I’ll link to their site if you want to check it out/ for more info. Essence do have a few actual highlighters in the line, that I have swatched in store. They’re nice enough, but nowhere near as good as the eyeshadow for creating a gorgeous glow. 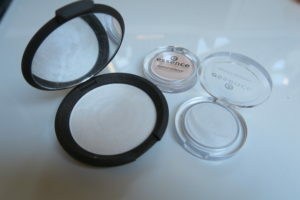 The pans are a generous size anyway for an eyeshadow and although a larger version would be great too, I do really like the portable, travel friendly nature of the eyeshadow size! There’s a few shades of the new Essence Mono Eyeshadow that would work perfectly as highlighter, depending on your skin tone. 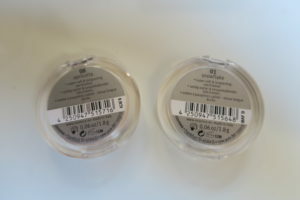 Out of the two I picked up, Snowflake is a beautiful pearl shade perfect for a fair to light skin and Apricotta is a slightly warmer tone, great for light to medium skin tone. There’s one called The Grammy Goes Glammy too, which would be amazing if you’re medium to dark, a really pretty gold tone. 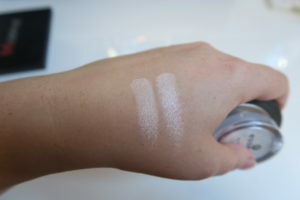 Snowflake is my favourite and as you can see from the pictures, it’s a really good dupe for Becca’s Pearl, which I do love and own too, but the price difference is huge (the Becca Shimmering Skin Perfector Pressed retails at £32/ €37) so if you’re on a budget or looking for a more affordable alternative, you can’t go wrong! These eyeshadows (aka unreal highlighters) are highly pigmented, silky smooth and blend effortlessly! In the mono shadow range, there’s mattes, shimmers and metallics and the one’s best for highlighting have a metallic finish, but don’t have any glitter and deliver a smooth, dewy sheen, natural enough for day time and works just as well built up at night for a stronger highlight look. Essence makeup is available in the UK nationally in Wilkos store and is stocked in larger Penneys stores and certain pharmacies throughout Ireland.